Feisty Infidel - a must watch! Taliban hangs 7-year-old boy for spying ! Can someone explain why it is that in Western Europe with its free press and multiple TV and cable news channels, the only place you will find this egregious story is on an obscure news blog? Lashkargah, 9 June (AKI): Taliban fighters have hanged a seven-year-old boy, claiming he was passing information to foreign soldiers in the volatile southern province of Helmand, the governor's spokesman, Daud Ahmadi, told Pajhwok Afghan News. Along with their Iranian sponsors, these Taliban are the people President Obama seeks to 'engage' in dialog - whilst 'kicking the asses' of softer targets like BP, Israel, Wall Street bankers etc. Besides, what does this term 'engage' really mean? You 'engage' gears - like first second or third. And if you 'engage' reverse gear ... you go backwards. Which is exactly where the Taliban want to take the world. What does Turkey's prime minister Erdogan have to do or say to make Israel finally understand that there is nothing to be salvaged from ANY relationship with him. Since the Gaza campaign, he has never stopped spitting in our faces, and yet our leaders still stubbornly insist it's only rain. 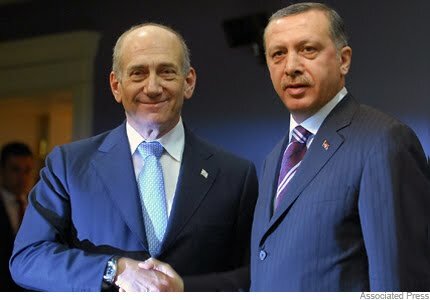 Even after Erdogan's bitter tirade yesterday, ex-prime minister Ehud Olmert urged the Israeli government to repair the relationship. He wanted to return to the good old old days, saying: "Back then we were loved by the entire world: all European dignitaries would visit Israel- even after Operation Cast Lead- in order to support us and bless us." Loved by the entire world ? European leaders blessing us ?? What planet is this man living on ??? What better evidence can there be that this man has truly lost touch with reality? It does explain why he considers Mahmoud Abbas (no less rabidly disposed to the Jewish state than Erdogan) to be a genuine 'peace partner' and why he was prepared to trust him with full control of Judea and Samaria including the hills overlooking Ben Gurion airport. The bitter truth is that the only time Jews were ever 'loved and blessed' in Europe was in the aftermath of the Holocaust - still denied by Abbas - as its few skeletal survivors were helped to their feet and spoonfed by allied troops. And even that good nature didn't last very long. But if Mr Olmert is so convinced of Turkey's vital importance to our people, I have a win-win solution for him and for Israel. Let him be sent to Ankara as Israel's new ambassador. Let him take his staff along as part of the consular team. His lawyer and secretary who helped corrupt his term as prime minister and the property developers who corrupted his term as mayor of Jerusalem. 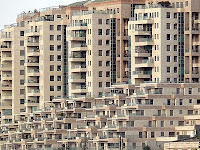 Let them build their illegal, grotesque and ill-gotten apartment towers in the Bosphorous instead of blighting the beautiful hills of Jerusalem. Let this disgraced leader who has taken leave of his senses, take leave of the people whose vital interests he took leave of long ago. Listen to the voices of IDF soldiers and watch this harrowing clip of our boys discovering that they were facing live gunfire from below decks of the Gaza flotilla ship Mavi Marmara. Turning now to our side, it is certain that heads will roll over the conduct of yesterday's operation off the Gaza shore. 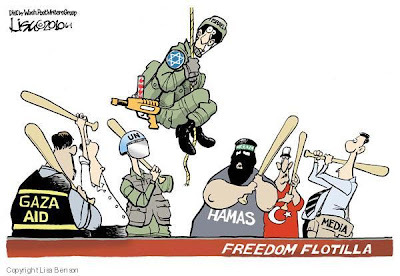 This was a clear failure of intelligence and planning in relation to a largely civilian flotilla which had been months in preparation virtually on Israel's doorstep. Is this the spirit of Entebbe? If we can mount a rescue operation half a world away, how can we fail on our own shores? And if we are able to place spies in the heart of Iran's nuclear programme, how can we not have infiltrated the 'useful idiots' on those ships and in the nearby ports of Turkey and Cyprus? The bravery of our troops is truly staggering. They came down those rappel ropes armed with 'paintball guns' to avoid harming innocents. Their holstered sidearms were strictly off-limits except for the kind of life-threatening circumstances which so quickly overcame them. The first side-arm to be unholstered turns out to have been snatched by one of the terrorists, as will soon be verified by the upcoming enquiry. Nevertheless, the commander in the helicopter continued to send down more of those brave boys down to certain harm in the bloody melee below. Contrast this to the extraordinary lengths to which Israeli pilots go to avoid civilian casualties, as shown here. It's time we stopped being saints playing with paintball guns. Iran, Al Qaeda, and its jihadist proxies have clearly shown that threats of nuclear genocide and deliberate suicide-bombing of civilians earns them respect from Western leaders who beg to 'engage' with them whilst doling out even more millions in 'aid' (or protection money as I prefer to call it). At the same time those Western leaders have shown there is nothing for Israel to gain by risking Jewish lives to save Arab lives. So let's take the gloves off and put the lives of our pilots, troops and civilians right up there in front. We 'gave' more than enough in the Holocaust. Do these useful idiots - many from Britain - not know that the people of Gaza are probably better off than they are? 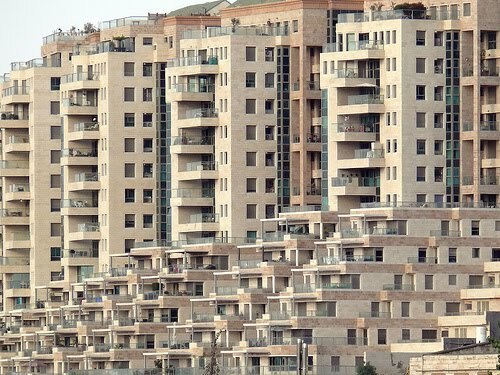 All their electricity and power is piped in from Israel - even under Hamas rocket fire. All their essential supplies of foodstuffs and medicines are trucked in by Israel - despite the suicide bombers who regularly infiltrate the checkpoints. Whatever they do not get from Israel is brought in through any one of over 1,000 tunnels dug under the border with Egypt, some of which are big enough to run cars through. Beyond what Israel supplies, there are the hundreds of millions of dollars dispensed by the US, EU in aid. Even the oil-rich Arab cousins send the occasional handful of small change. If these useful British idiots ever took the time to research their chosen subject, they would realise that the plight of Gazans has little to do with Israel and everything to do with the Iranian terror command which has taken over their homes and their lives. Iran's Hamas proxies in Gaza combined with its Hezbullah proxies in Lebanon and Syria have amassed a total of over 50,000 rockets and missiles, all of which are targeted against Israel. No other country on earth faces this - or ever has. It seems inevitable that these missiles will be launched at some time, and if the previous tactics of Hamas and Hezbulla are repeated, they will most likely be launched from schoolyards and hospital carparks. This will only give rise to the most devastating reprisals from a nation determined to protect the survivors of its last holocaust. Hamas leader Ismail Haniyeh - whose command post during the Gaza war was located in the basement of Shifa Hospital - claims that today's events at sea 'represent a great victory'. For such jihadists, all loss of life is cause for great celebration. Not long ago Haniyeh's people were throwing Gazans off rooftops of highrise buildings in Gaza City. So, you have to wonder: why do civilised Europeans - even the useful idiots among them - support such bloodthirsty killers, kidnappers of journalists, beheaders of hostages, and abusers of women? It totally defies logic that the target of their hatred should be the only democracy in the entire region and the only one which affords complete freedom of worship to all religions and more human rights and women's rights than exist in any Arab country. So, why do normal and civilised people side with such barbarians? Pure and simple - fear. It dates back to the creation of the Palestinian story, which began in the 1960's and was brought to everyone's attention by the first hijackings and other acts of international terrorism for which Arafat, Al-Fatah, Black September and the PFLP became famous. Germany went as far as faking a hijacking of its own Lufthansa plane in order to stage the release of the PLO's Munich Oympic killers. The useful idiots have nothing to fear but fear itself. 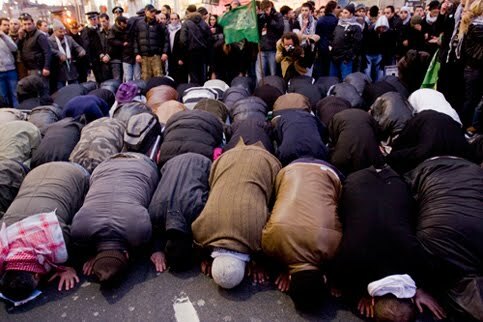 By the scenes filmed this afternoon on London's streets, I think they should be more worried about what's become of Britain than what might become of Gaza.